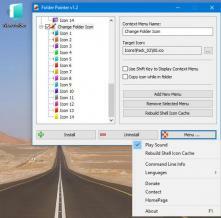 Folder Painter is a functional piece of software that enables you to color-code the folders on your computer so you'll be able to find the files you need faster. The program installs as a context menu item so it doesn't have a graphical interface. Instead, you'll be able to access Folder Painter from the context menu that appears when you right-click any folder. There are dozens of colors that you can use to change the folder icon color and most of them are shades of red, blue, and green. You can use these colors to indicate a certain type of data, as well as priorities. The application enables you to revert to the default folder settings at any time. Also, Folder Painter provides CMD support so you can use its functions via the Command Line as well. Arrange all your applications' windows in just a few steps.